"The tiny house movement is growing,” says Amy Turnbull, a state chapter leader and one of the directors of the American Tiny House Association. "As more people advocate their acceptance, more areas will allow them." In fact, there are many places where micro house dwellers currently live side by side in the U.S., and more are in the works from eco-villages to vacation retreats. Here are 15 tiny house communities that are shaping the future of small space living. Habitats Tiny Homes is a custom building company that's currently developing the first, master-planned tiny house community 11 miles outside of San Diego, California. But the sustainable goodness doesn't stop there. All homes will pack energy-saving features for reducing the community's overall footprint including solar power and water reclamation. If you're looking to ditch the city or burbs for the open prairie, Spur, Texas, the first town in the U.S. to welcome tiny houses, invites you to settle down. But before you pack your bags, understand Spur's rules for fun-size homes: Yurts and "natural" homes built with materials like straw, mud or clay, both earth homes, and straw-bale houses are examples, are not permitted. Also, no matter how small, all dwellings require an adequate foundation and flush toilet hooked up to local utilities. There's more to know at Spur Freedom. Currently, 13 wee abodes call the R.V. park home. We recently heard that there's room for around 40 more. Monthly rates range from $350 to $550 per month. See more photos at Orlando Lake Front. 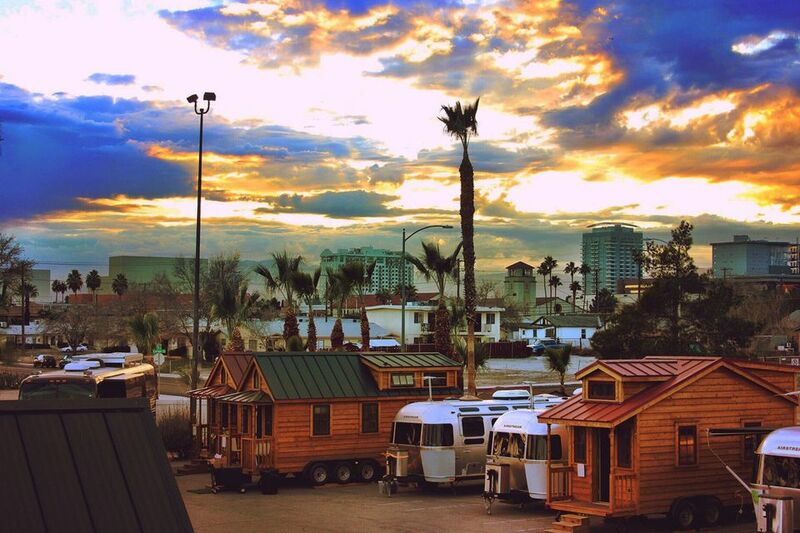 Not many tiny house dwellers have a net worth of $840 million unless you're Zappos CEO, Tony Hsieh. He happily lives in a 240 square foot Airstream with his two pet alpacas in Las Vegas, Nevada's first tiny house community. Called Airstream Village, it's a part of a project created by Hsieh to revitalize the city's ailing downtown. The village has around 30 dwellings, a mix of Airstream trailers and pint-size homes by Tumbleweed Tiny House Company. Monthly rent is $1,200 including utilities and Wi-Fi. But if plan to move in, you better like big furry creatures. Hsieh's alpacas, Marley and Triton are usually roaming around the village. For more details contact Downtown Project. The largest development in the works is in Salida, Colorado, also known as the "heart of the Rockies." With 200 rental homes, it will be the largest tiny house community in the nation with homes ranging in size from 260 to 760 square feet. The second project is a subdivision in Walsenburg, Colorado with 33 micro homes ranging in size from 260 to 670 square feet. Sale prices start at $60,000. You can build your small dwelling on a lot you can live on at Lemon Cove Village. It's a tiny house friendly RV community nestled in the foothills of the Sierra Nevada in California, a short drive from Sequoia National Park. The rural community features amenities typically found in walkable urban neighborhoods like a dog park, community garden, and laundromat. Find a complete list of amenities at Lemon Grove Village. View the brochure at ​Traverse Bay R.V. Also known as a granny pad or mother-in-law flat, an ADU is an abode built on a lot of an existing home. Teensy structures like these are always a fraction of the main house's size. Green ​homebuilder, Orange Splot constructed the two 526 square foot ADUs shared here in a client's backyard. Dubbed, "Ruth's Garden Cottages," each one has a porch, full bathroom and sleeping loft. The inhabiters share the kitchen in the primary dwelling. Get inspired by these photos at Orange Splot. Need a spot to park your tiny house on wheels STAT? You can be one of the founding residents at The Sanctuary Minnesota Village. It's a countryside oasis for adults only. Owned by Bill and Brenda Campbell, the pint-sized community is offering tiny house dwellers a place to park and live with a six-month minimum lease. Don't own a small house? They also have a couple of homes available to rent. Sorry dog lovers, cats are the only pets allowed on the premises. For more details contact Alchemy Architects. Reach out to Cass Community Social Services. Downsizing doesn't mean giving up cushy interiors or gorgeous scenery according to LuxTiny, a custom homebuilder that specializes in small, luxury dwellings. They're in the midst of creating the first tiny house community in the White Mountains of Arizona consisting of 45 spaces on six acres. Lease rates for plots are $360 or less. Homes to buy starting at $64,900 or you can rent starting at around $800 per month. All residents will have access to 19,000 square feet of green walking space. Get on the waitlist at LuxTiny. Whispering Aspen Village is a tiny house community 38 minutes away from Colorado's Breckenridge ski resort. For as little as $100,000 you can own land and a park model tiny house by EcoCabins to enjoy as a primary residence or second home. Want to make a move? Visit EcoCabins. Homebuilder, Jay Shafer became the face of the tiny house movement after he penned and published the Tiny House Book in 2009. Currently, he's developing the first tiny house community in California's Sonoma "Wine" Country. See other projects by Four Lights Houses.